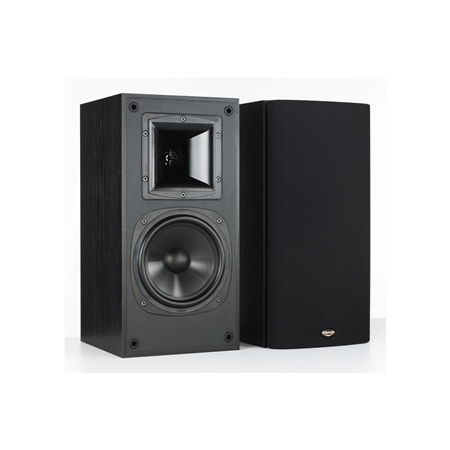 Synergy bookshelf loudspeakers prove that great sound can come in small affordable packages. The SB-2 bookshelf speaker is the perfect step-up solution for a powerful full-range system that still has the benefits of a compact size. Standing just 15-inches tall the SB-2 incorporates the same driver technology as the SF-1 floorstanding speaker - a 1-inch aluminum-diaphragm compression driver with a 5-inch square Tractrix® Horn and a single 6.5-inch graphite-injected woofer. The SB-2 offers the same features as its larger Synergy Series counterparts including a high-definition crossover network and an internally braced enclosure. Its cast-polymer woofer frame has exceptional impact tolerance to protect the driver's internal parts and maintain their critical alignment. A rear-mounted port increases efficiency and extends bass response allowing high output with low distortion and low turbulence. Klipsch's unique woofer venting system keeps both the magnet and voice coil cool to ensure long-term reliability. The SB-2's enclosure employs the highest-quality MDF construction and is finished in jet ash vinyl veneer. This bookshelf also features a "floating" or suspended grille design which minimizes image-impairing sonic reflections. This rock-solid performer delivers all the "oomph" of movie explosions and intricate musical detail that is often associated with large floorstanding models.